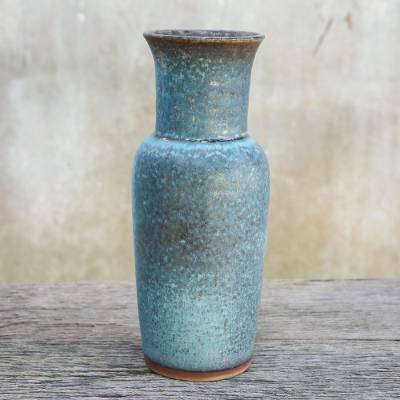 Artisan Handmade Turquoise Blue Ceramic Vase from Thailand, "Vintage Decor"
Duangkamol's vase is crafted in classic vintage style, with a brown speckled pattern over turquoise blue. The ceramic is handcrafted and glazed to give the vase a subtle gleam. 25 cm H x 8.8 cm Diam. 9.75" H x 3.5" Diam. You can find ceramic vase 'Vintage Decor' by Duangkamol in vases categories such as Ceramic Vases. Enjoy exploring these sections for other Novica treasures.